Is there drama in bytes? Or poetry in the smart phone? Only a Luddite would reject out of hand such tantalizing prospects for Santa Fe Opera’s 2017 premiere, a co-production with San Francisco Opera and Seattle Opera about the computer entrepreneur Steve Jobs, co-founder and CEO of Apple Inc. On a beautiful summer evening at one of the world’s great outdoor stages, this new work by librettist Mark Campbell and composer Mason Bates held out the possibility of a useful update to opera’s venerable operating system, one inspired by our trusty devices. Notwithstanding the suggestive title, (R)Evolution steers mostly clear of Steve Jobs’ creative evolution and his transformative role in the digital revolution. Instead, it’s a series of short scenes that focus on his relational and spiritual issues. Part of clutch of contemporary operas about important events and people (from Satyagraha through Dr. Atomic), (R)Evolution is an opera about a brilliant, if testy, computer nerd. 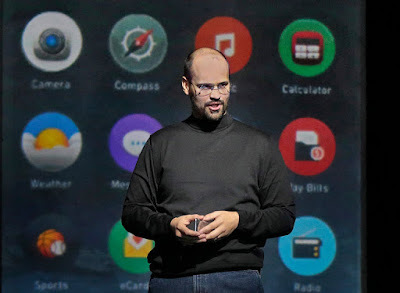 Unlike the elegant iPhone, however, Campbell and Bates’ opera makes little effort to infuse technology with artistry; instead, it’s an operatic bio of a socially awkward guy who becomes an arrogant corporate chief. Edward Parks as Steve Jobs. Image by Ken Howard for Santa Fe Opera. One wonders whether the co-commissioning entities, both in cities where the tech industry is especially powerful, had any qualms with the eventual direction of this opera’s story. Campbell’s recent collaboration with Kimberly Reed and Laura Kaminsky on Some Light Emerges, a Houston Grand Opera commission, was a beautifully nuanced meditation on that city’s Rothko Chapel and its visionary philanthropist Dominique de Menil. His libretto for (R)Evolution, while understandably less flattering, glides over Jobs’ achievements to spotlight instead his flirtation with Zen Buddhism and many character flaws. Like a modern novel or film, the opera travels back and forth in time, providing occasional motivations or connections: various scenes show him treating his girlfriend and wife badly, disavowing his own child, and behaving in a ham-handed way with colleagues. As “Steve Jobs: 1955-2011” appeared as a projection in the last scene, his wife Laurene sang directly to the audience, admonishing us to ignore the devices in our pockets for moment so that we could ponder the work’s message. I obeyed but started plotting my way to the car instead. And yet, the final notes on August 4 brought cheers from all corners of the house. I was clearly one of the few who left unsatisfied over the lack of a dramatically satisfying story. At the very least, Kevin Newbury’s sleek production has generated considerable enthusiasm and interest, and that’s great news for the operatic community. (Santa Fe Opera has added an additional performance of the work.) Its lack of depth, humor, and meaning compares poorly, however, with more successful contemporary musical works about influential creators or world leaders: there’s none of the profound questioning of Nixon in China and little of the historical fantasy or life lessons of Sunday in the Park with George. (R)Evolution barely scratches the surface of its subject’s unique insights into technology and design, which forever changed the ways we work, play, and interact with each other. The tech wizardry Steve Jobs instigated is largely relegated to the rotating scenery, where projections of copyright-cleansed digital information (by 59 Productions) careen and buzz to great effect, alongside a well-rehearsed chorus of kinetic techies. Vocally, the evening had many fine moments, thanks to an excellent cast that tried hard to transcend a hackneyed storyline. Mezzo-soprano Sasha Cooke (as Laurene) and tenor Garrett Sorenson (as Steve Wozniak, his long-suffering business partner) made the strongest impressions, in crucial scenes that offered glimpses of humanity and raw emotion as they tangled separately with the arrogant Jobs. Solid contributions from soprano Jessica Jones (as Chrisann, his first girlfriend) and bass Wei Wu especially (as the ghost of Kobun Chino Otagawa, Jobs’ spiritual advisor) enlivened several shorter scenes. Baritone Edward Parks, who sang the title role quite capably, inhabits Jobs visually but never ignites dramatically, perhaps because the libretto leaves him little room in which to maneuver. Seemingly immune to Laurene’s earnest encouragement and Otagawa’s oracular prayers, Jobs the operatic character remains to the end a precocious savant with few social skills. 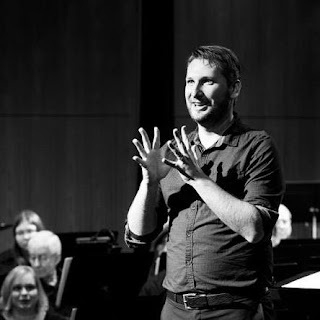 Mason Bates’ music, by turns sensuous and driving, matches the quick pace of Campbell’s libretto and finds a champion in conductor Michael Christie, who provided a sure hand in the pit. With nineteen short scenes to set, Bates opted for maximum variety over consistency of expression. His scoring is happily eclectic, with minimalist orchestral figuration mixing with incisive guitar licks and various electronic twangs. His vocal writing aims squarely toward the middle, somewhere between the lyric and the jazzy, and with the constantly shifting scenes there’s not much opportunity for character development. Only once or twice do we get some inkling of what Bates might do with stronger material: the big confrontation scene between Jobs and Woz, for example, veers towards Italianate high drama but with a funky rhythmic edge. The seamlessness with which Bates mixes textures and styles is indeed impressive, as other reviewers have noted. Though Bates avoids overt musical allusions, Campbell’s libretto invites such things at least a few times, with Jobs invoking Bach as a musical ideal while high on acid in an apple orchard and again in the garage of his family home. (R)Evolution might usefully have indulged its namesake’s extraordinary prescience a bit more. Steve Jobs’ lasting contribution to society, after all, is his creativity—not his trail of failed relationships. Matthew Dirst is Professor of Music at the Moores School of Music, University of Houston, and Artistic Director of Ars Lyrica Houston, with which he has made a number of acclaimed recordings, including the world première recording of J. A. Hasse’s Marc Antonio e Cleopatra, a Grammy nominee for Best Opera 2011. 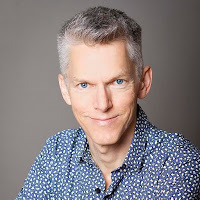 A prize-winning organist and harpsichordist, his publications include Engaging Bach: The Keyboard Legacy from Marpurg to Mendelssohn (Cambridge University Press, 2012), and more recently, he edited Bach and the Organ (University of Illinois Press, 2016). Final Fantasy XII: The Zodiac Age is the latest HD remaster from Square Enix, and with it comes an extensive remastering of the original soundtrack. In contrast to previous Square Enix HD re-releases, such as Final Fantasy X/X-2 HD, this reorchestration uses much of the same musical material. However, when compared with the remastering in Final Fantasy X/X-2 HD, there is a vastly greater difference in sample and sound quality, changing the feel of the score without a need for drastic reorchestration. The HD release offers two main soundtrack options, the original PlayStation 2 music and a re-orchestrated version to accompany the now higher-fidelity graphics, with the ability to toggle between the two during gameplay (See fig 1). For those with a collector’s edition, there is a third ‘Original Soundtrack’ option available, this option uses the same tracks from the original soundtrack CD released alongside Final Fantasy XII in 2006 and is entirely recorded by a live orchestra, opposed to using synthesised instruments. Figure 1. 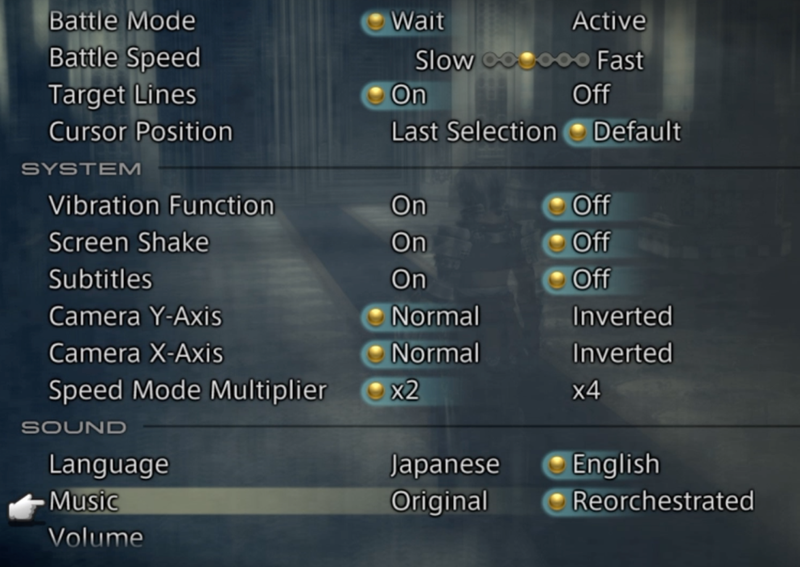 Configuration screen from Square Enix’s Final Fantasy XII: The Zodiac Age. Although both the original PlayStation 2 and remastered versions are synthesised, each orchestration has a distinctive feel, perpetuated by the sound quality and timbres. To explore these differences in sound quality and timbre we can compare ‘The Dalmasca Easterland’ theme from each version, starting with the original music. Whilst Hitoshi Sakimoto orchestrated the music for full orchestra, this piece still has a strongly synthesised feel due to both instrument sample quality and quantisation. The synthesised brass jumps out as the most un-natural timbre, as natural brass has a much larger spectral profile. The quality of the brass is better in the higher volume and higher pitched sections as there is some raspy quality to the sound which gives it a fuller, bigger feel, but it is a generally more subdued timbre than heard in live playing. The strings again sound heavily compressed and closer to a synthesised string-styled pad opposed to live strings. When the strings enter with the theme at 1’01’’ you can hear the strict quantising of the midi data which leads to a more robotic sounding melodic line as it’s missing humanised performance elements such as slightly extending and emphasising strong beats. In isolation, the overall sound quality isn’t poor considering it was produced over a decade ago (2006), as sampling and synthesis technology has continued to develop over the years to create more sophisticated sounds. At its time of release, these synthesised orchestral timbres were cutting edge and as close to real instrument timbres as feasible in a video game, and were certainly a huge improvement on the timbral quality of previous Final Fantasy games. However, when compared with the HD remastering there is a stark difference in sound quality. By adding humanised performance gestures and using much higher quality samples, the whole piece has a brighter and more open feel, the timbres have a richness to them and the individual lines are easier to distinguish. If we look purely at the overall sound output we can see that there is more varied frequency activity in the remastered track. The overall frequency pattern is the same, as the general orchestration is similar, but there is greater frequency response in the remastered version, especially in the upper regions, creating this more brighter, fuller sound (See fig 2.1 and 2.2). The slight change in instrumentation will also attribute to this, such as an increase in the use of strings and a lessening of brass in the remastered version. However, like the brass, the string samples in the remastered track are much better quality and greater attention has been paid to increasing the naturalness of the playing, making it more difficult to distinguish whether it has been synthesised or if it is a live recording. Figure 2.1 Frequency analysis from ‘The Dalmasca Easterlands’ at 0’26’’ from Square Enix’s Final Fantasy XII. Figure 2.2 Frequency analysis from ‘The Dalmasca Easterlands’ at 0’26’’ from Square Enix’s Final Fantasy XII: The Zodiac Age. Although this isn’t Square Enix’s first HD remaster, it is the first remaster with such a distinct difference in audio quality. Final Fantasy X was more drastic in its reorchestration across the main musical themes, but if we compare ‘Tidus’ Theme’ from the original Final Fantasy X with its HD counterpart we see how relatively close they are in sound quality. The original track is very obviously synthesised, with the picked guitar accompaniment underpinning the main melody being both static in volume and in string attack, giving the music an obviously sequenced feel. The synthesised instrument timbres in the HD version are marginally better than the original, but the overall sound is still heavily compressed and is missing the sparkle and musicality which The Zodiac Age remastering brings to life (See fig 3.1 and 3.2). The synthesised nature of the timbres is especially clear in the string pad and brass, with both missing some richness of timbre. Whilst the remastered track adds some vibrato to the strings it is a robotically flat vibrato across all notes, and a slower attack time without accounting for sufficient sound decay again adds to the un-natural feel of the timbres. 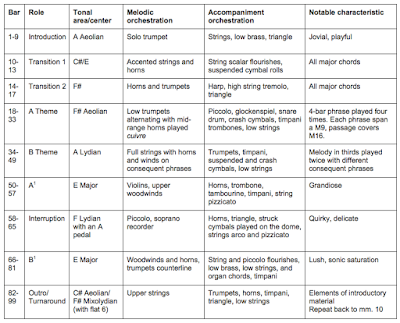 Figure 3.1 Frequency analysis from ‘Tidus’ Theme’ at 3’15’’ from Square Enix’s Final Fantasy X. 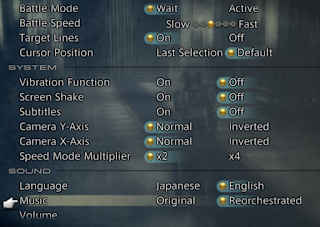 Figure 3.2 Frequency analysis from ‘Tidus’ Theme’ at 3’15’’ from Square Enix’s Final Fantasy X HD. Jonathan Sterne suggests, ‘The promise of better fidelity has always been a Hegelian promise of synthesis and supersession’ and whilst the remastered tracks may be of higher fidelity, they don’t necessarily supersede the originals in terms of value to the player. In The Zodiac Age, the biggest difference in feel comes from the naturalness of the playing, using varying attacks and more natural decays, adding vibrato with greater musical thought. Whilst this creates more realistic stand alone pieces, the compression and quantisation of the original tracks could be advantageous to gameplay, facilitating better concentration as the music has fewer dips and peaks. The remastered tracks are arguably truer to Hitoshi Sakimoto’s compositions, as they allow the payer to hear these pieces on better quality orchestral timbres, but they lose some of the charm of the original tracks. In isolation, the remastered sound is significantly better. However, that doesn’t mean they are significantly better for the game, and it conjures up questions of authenticity. 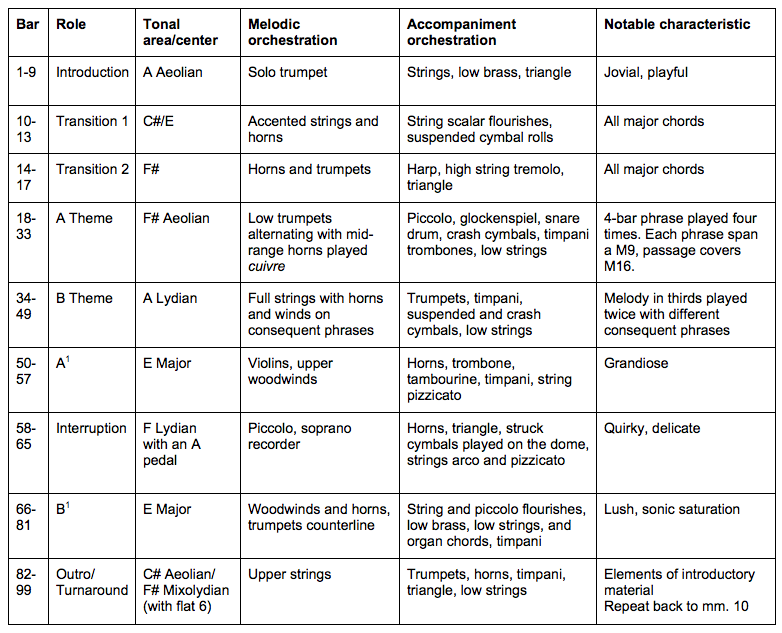 In his discussion of re-orchestrations and authenticity, William Gibbons suggests it is easy to view these very “unreal” timbres as a problem to be fixed so fans can experience the music “how it was meant to be heard”, and this has to be weighed up against the value of nostalgia for players who are familiar with the series and with the more electronic sounding timbres. It is also worth noting that whilst you can toggle between orchestrations you can only see the remastered graphics, which both adds to the nostalgic value of the PlayStation 2 music as it brings the old to the new, and adds significance to the remastered sound as it brings the scores to modern day fidelity expectations. Regardless of the positive or negative impact of the remastered score on player enjoyment, there is an undeniably stark contrast between the sound quality of the original and remastered soundtracks, far greater than previous HD releases. A combination of better instrument samples and humanised playing, facilitated by an increase in the capabilities of music technology, has given the music of Final Fantasy XII a new lease of life. Kate Mancey is currently completing her masters of research at the University of Liverpool. 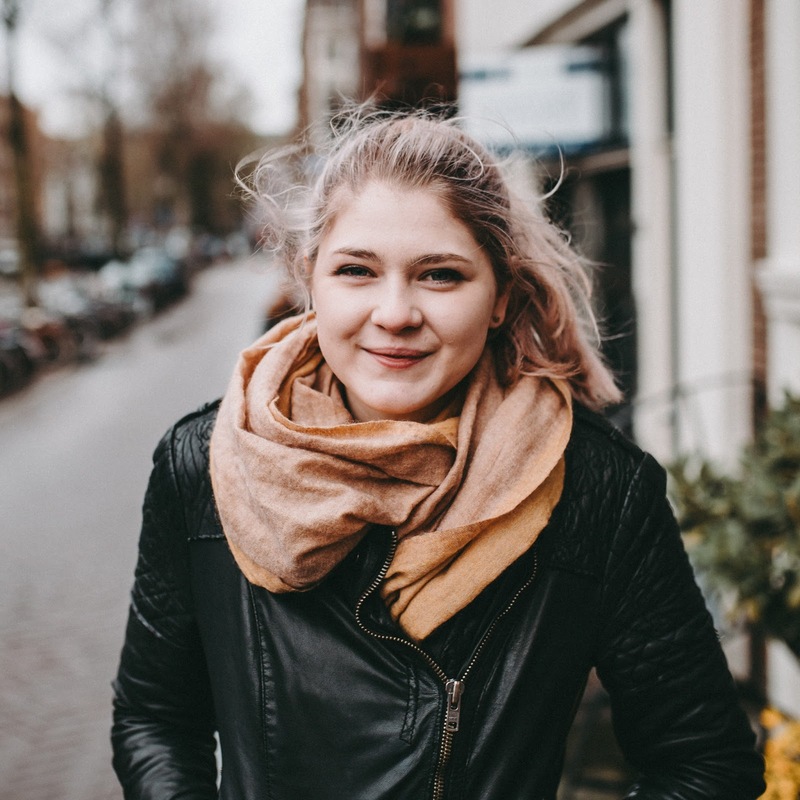 Her thesis focusses on the role of music and sound in virtual reality video games. 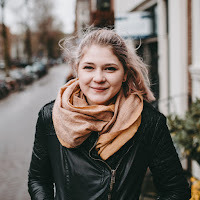 She has presented papers on her research both in the UK and internationally, and has authored an article in the forthcoming volume of TransMissions. Outside of academia, Kate works as a composer and sound designer for video games and independent films. Gibbons, W (2015). How It’s Meant to be Heard: Authenticity and Game Music. The Avid Listener. Available here. When playing a Final Fantasy game, there are a few things that generally remain consistent between games: a character named Cid, a spectacular world with a crystal-centric mythos, and an epic storyline that (depending on players’ agendas) can span anywhere from 10-100+ hours to complete. Final Fantasy XII (Square Enix, 2006; hereafter FFXII), originally released for the PlayStation 2, was no different in this regard. Now eleven years later, the game has been remastered and rereleased for the PlayStation 4 under the title Final Fantasy XII: The Zodiac Age (Square Enix, 2017; hereafter The Zodiac Age). 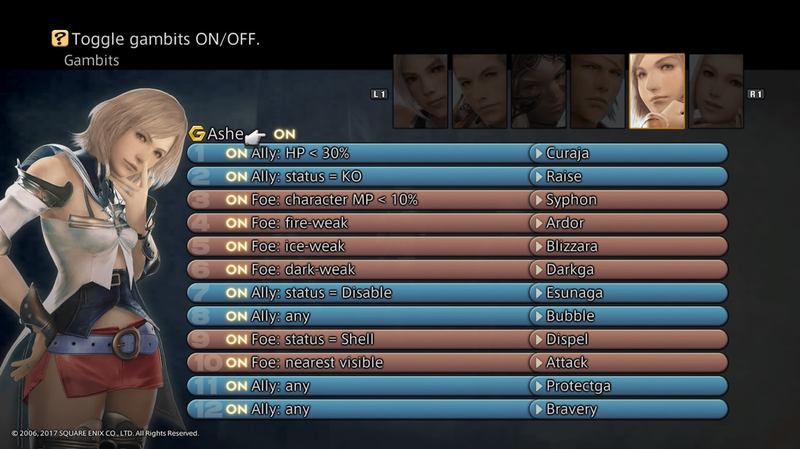 While many players of The Zodiac Age are likely to focus their attention on the game’s revamped job system and its newly remastered HD graphics, the game also boasts a number of other noteworthy changes from the original release of FFXII. These changes include a reorchestrated and rerecorded version of Hitoshi Sakimoto’s musical score (a selling point since it was first announced at E3 in 2016) and the ability to play the game in “Turbo Mode” (i.e. at either 2x or 4x the game’s normative speed). It is on the (musical) experience of playing the game in this Turbo Mode that I wish to focus on for the duration of this essay. The decision to add the Turbo Mode feature was made in order to help facilitate traversing the game’s sprawling world of Ivalice, however it is also a useful tool for quick level grinding (the act of continually battling weaker foes in a set area to quickly raise characters’ levels). While all diegetic events (inclusive of footsteps, the sounds of battle, and other sound effects) that players control are sped up in Turbo Mode, the game’s (nondiegetic) score continues at the same speed. In many ways, this makes perfect sense: not only is the music nondiegetic (and thus unaffected by the speed change within the diegesis), but the inclusion of a sped-up score would more than likely create too cheesy and gimmicky a tone for the high fantasy world of the game. The Zodiac Age, however, employs an Active Dimensional Battle (ADB) system wherein players preemptively prescribe actions characters will carry out under a variety of circumstances (akin to a quasi-“if-then” code; see Figure 1). Figure 1. 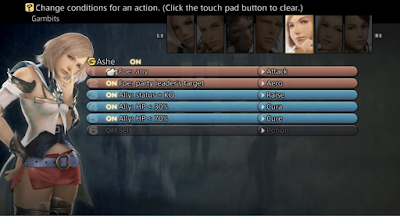 Example of The Zodiac Age’s gambit system. Screen capture by author. While there is no shortage of strategy needed to piece together the correct gambits to take on varying foes, utilizing them essentially removes players’ direct control over characters when in the thick of battle (arguably the main reason it is possible to partake in these battles at 4x speed). In the case of level grinding, this may be a welcome relief—battling dozens (or even hundreds!) of easily-beaten foes is a menial task at best. In contrast to Grasso’s “flow of time” and Kinne’s groove networks—both of which account for players participation in the battle during the battle—then, the game’s ADB system creates a temporal space where players can sit back, relax, and enjoy the game’s soundtrack during battles, listening to the accompanying music in its entirety without worrying about the battle taking place. While this is all well and good whilst grinding or traversing Ivalice, there is one particular scenario that musically suffers in Turbo Mode: boss battles. These plot-advancing battles that occur in the narrative, what Mikhail Bakhtin might identify as the “then suddenly” encounter chronotope, have their own epic battle music. Yet in turbo-time the music associated with these encounters is lost amidst the sounds of battle within the diegesis. While grinding, players will intermittently hear the battle cries of their party and the sounds of various attacks connecting with foes. Because these battles against weaker adversaries pass by as quickly as they do when in Turbo Mode, the game’s score remains relatively unaffected—at least in the grand scheme of things. However, because bosses are considerably stronger and have more stamina than normal foes, the battle cries that normally take only a second or two are instead littered across the entirety of the sound track, obscuring the marked boss battle music. 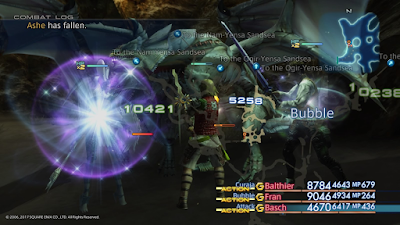 If we as players or scholars (or both) are to assume that the music for boss battles should have a similar level of importance to the game as these narrative encounters, then toying with the game’s temporal landscape seems disingenuous to the previously prescribed phenomenological and narrative experience of the game as set by the original FFXII—even if Turbo Mode is a perfectly valid ludic option in The Zodiac Age. Especially with the remaster’s attention to the musical score (going so far as to offer a copy of the soundtrack as incentive for players to buy the collector’s edition of the game), diminishing the importance of the epic boss battle music by way of a newly added feature to The Zodiac Age seems counterintuitive at best and counterproductive at worst: counterintuitive in that this advertised soundtrack is potentially glossed over in the context of the game itself; counterproductive in that, without the the epic music to elevate these crucial battles, the experience of the boss battle is reduced down to nothing more than the sounds of battle. This latter point is troubling in that it musico-narratively prioritizes unmarked battles over marked ones. As I hope to have shown, meddling with time in The Zodiac Age (the Time Battlemage job class aside) has unusual and perhaps unexpected consequences for the game’s musical soundtrack. While unaffected in terms of tempi, playing the game in Turbo Mode reduces the prominence of what should be the marked “then suddenly” music (such as the Boss Battle music) in favor of the diegetic sounds of battle. In direct contrast to this, unmarked “normal” battles over the course of the game pass by quickly enough that the accompanying music is comparatively uninterrupted by the party’s battle cries. This is particularly true when players are grinding in a set area with its own distinct musical territory. While the entirety of the game was not necessarily intended to be played in Turbo Mode, accounting for the musical consequences that do occur when playing in it offers an interesting musico-narrative reasoning as to why players should avoid abusing their newfound mastery over time in The Zodiac Age. Stefan Greenfield-Casas recently completed his MM in music theory at The University of Texas at Austin. His research interests include the relationship between music and epics, ludomusicology, and critical theory. He has presented on these topics and others at a number of conferences, including meetings of the Texas Society for Music Theory, Music and the Moving Image, and the North American Conference on Video Game Music. 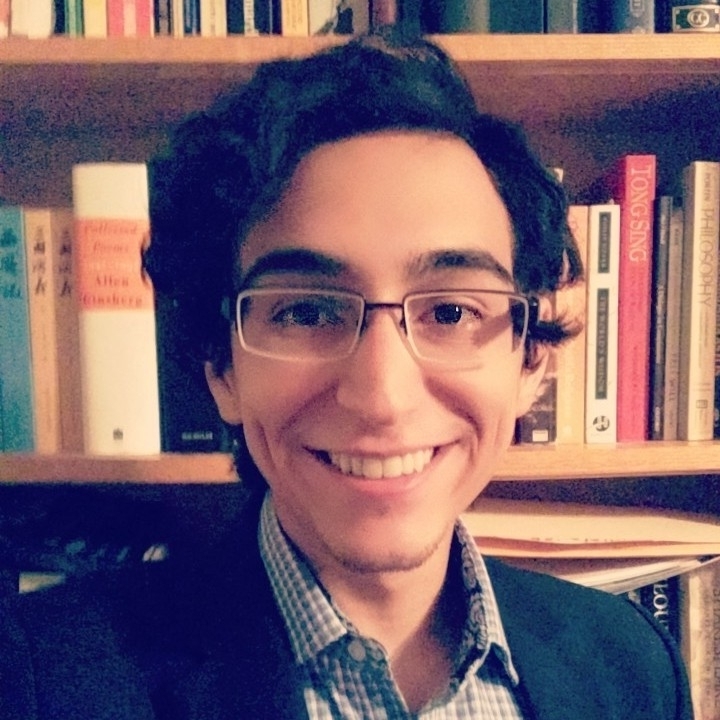 Stefan will begin his PhD in music theory and cognition at Northwestern this fall. “Jobs” in ludic discourse refer to a class a character belongs to, as well as the abilities and equipment that are associated with this class (e.g., an archer would be able to use a bow and arrow and might have an ability to raise their accuracy while a mage might instead equip robes and use various magics). See Kate Mancey’s frequency analysis of FFXII’s original score versus The Zodiac Age’s remastered version of the score in her forthcoming contribution to this series. See Ryan Thompson’s recent take on why Ivalice is as large as it is in his post and Lee Hartman’s extended discussion of grinding in his forthcoming essay. Julianne Grasso, “Music in the Time of Video Games,” (paper presented at the annual meeting for the Society for Music Theory, St. Louis, Missouri, October, 2015). Jesse Kinne, “Groove Mediates Ludo and Diegetic Temporalities in Heroes of Might,” (paper presented at the twelfth Music and the Moving Image Conference, New York University, New York, May, 2017). For instance, in my own playthrough I spent one two-hour (plus) gaming session level grinding in a region called the Dalmasca Westersand. Mikhail Bakhtin, “Forms of Time and of the Chronotope in the Novel” in The Dialogic Imagination: Four Essays by M.M. Bakhtin, ed. Michael Holquist, trans. Caryl Emerson and Michael Holquist (Austin: University of Texas Press, 1981), 92. Other sounds, such as items being picked up-post battle, may further (briefly) distract from the game’s score, however I maintain that because each area’s music is looped, players that spend any extended period in an area will hear the track in its entirety. For reference, most of the boss battles I have played through in Turbo Mode were over in less than 30 seconds; normal battles are generally completed within 1-5 seconds depending on the number of foes the party is engaging. It should also be noted that one strategy for defeating bosses relies on “Quickening Chains,” a series of special attacks that can be linked together to deal massive amounts of damage to enemies (and thus particularly conductive to boss battles). While these Quickenings are not performed in turbo-time, they are driven by players’ reaction times to selecting a series of onscreen prompts within a four-second timespan (thus still forcing players’ attention away from the score). Furthermore, with each successive Quickening there is a corresponding explosion that further obscures the score, thus still redirecting players’ attention away from the music.